This is the campaign log for the fifth session of a google+run Wandering Heroes of Ogre Gate campaign. The previous session is described HERE. The party had a meeting with Stone Foot (the bandit leader who had killed the innkeeper Pei Hai and assumed control of the inn with his men). He explained that below the inn was a Tomb to General Lun and that at the end of this structure was a secret passage where the old innkeeper had started tunneling. If they continued the tunnel, it would lead to a one-thousand year old treasury known as the Emerald Empire. The problem he faced was traps. The general's tomb was ridden with traps and he had already lost several men to poisoned darts and pits. He wanted the players to help him disarm and get through the tomb, then they'd work together breaking into the treasury. San pointed out that if he knew the location of the treasury, they could just dig down from the surface and avoid the tomb entirely. Stone Foot said they could do that if they had the right equipment. They would need a drill to break through the rocky surface. He knew of some salt mines though the desert to the south west but said they were controlled by Li Fan soldiers (who were under the empire's authority). The party decided to take a chance on the mines. They travelled about 12 miles through the desert and found a courtyard house overlooking the deposits. San noticed that there were dead soldiers around the house and inside the men looked too ragged to be officials. They decided to give the impression they had a sizable force and see if they could intimidate the residence to hand over some equipment. When they knocked on the gate a man appeared and looked terrified. The players said they were a passing army in need of some supplies. The man slammed the door closed before anyone could stop him. Bone Breaker pushed the door open and grabbed the man's hand. Behind the man they could see others cowering as well. Dropping to his knees the man screamed something about a Sand Demon. Bone Breaker said the Sand Demon wouldn't be a problem provided he did as he was told. They ended up finding a nice bamboo cable drill with a wheel. It was a bulky structure and would have to be transported on their camels in pieces. They then bullied the man further and told him to take some of his men along to help them set up the drill. The man resisted at first but gave in when threatened with the Sand Demon. Reaching the inn, they set up the drill and started to pulverize the ground. While most of the area was solid, there were patches of sand surrounding them. As the men worked the drill one of them went to get some water and was pulled below the sands. All the other drillers immediately ran mindlessly into the desert screaming that the Sand Demon had come. Bone Breaker went to head them off, but was pulled below the sands himself by two great claws and felt something stab him in the back, followed by a great burning sensation. Jade Priestess dove below the sands and attacked whatever grabbed him, pulling him back to the surface. The party returned to the inn and Chen determined that Bone Breaker was the victim of Fire Poison. Very dangerous as its effects were permanent, so quick treatment was essential. He bought Lotus Oil from a scholar at the inn and Jade Priestess administered the antidote along with a pill to speed the recovery. While Bone Breaker rested, San asked everyone in the inn about the Sand Demon. No one knew anything, but when she got to the man who was dressed as Reckless Storm he told her a story about an innkeeper who fell in love with a scorpion from the desert, how the innkeeper would lure out the scorpion by playing Bliss in a Lonely Orchard on his flute and that the two become lovers. However, the innkeeper was murdered, leaving the scorpion alone. There were musicians in the inn so San went to them to see if they could play Bliss in a Lonely Orchard. Their reaction was odd. She didn't quite understand it,but they clearly didn't like the idea of having their services hired. She told Stone Foot to keep an eye on the musicians and let her brother know if anything odd happened. She also told him about the story. Late in the night the innkeeper came into Bone Breakers room and told him that a messenger had arrived, spoken with the musicians, then left. He gathered his men and went to the musicians inn room, forcing open the door. First he insisted they hire out their services then demanded to know what the message was about. The leader, who went by the name of Zhen, told Bone Breaker not to interfere with their affairs. 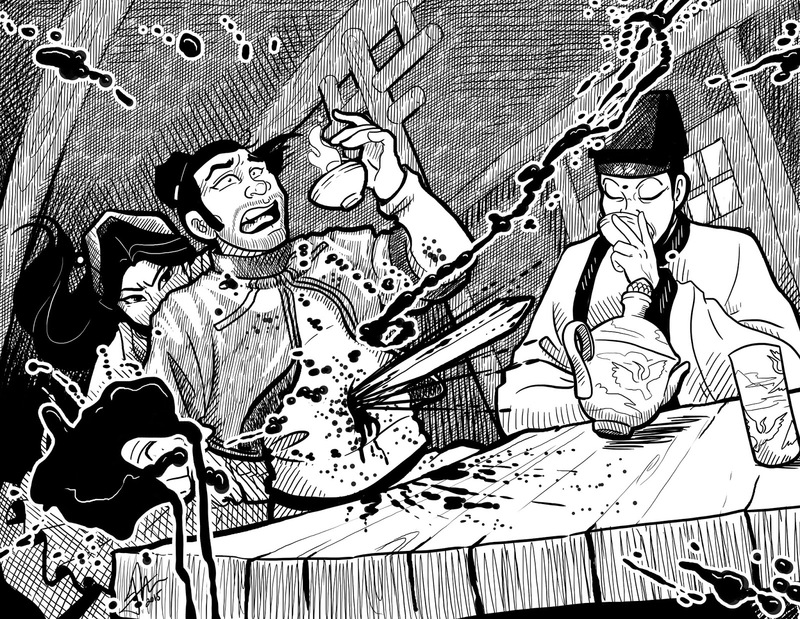 Enraged, Bone Breaker grabbed the man's wrist, hoping to threaten him, but he immediately detected great power flowing through Zhen's veins and withdrew. When told everyone but Bone Breaker to leave the room. They talked and Bone Breaker learned that the men were here to find someone, a woman named Niang (Bone Breaker had spoken with the women the night they arrived and she said she was a farmer heading to Hai'an but used a different name). Zhen said he would give Bone Breaker the services of his men, if he would convince Niang to to head to a hill in the north east at an appointed time. Bone Breaker agreed asking for more details so he could convince her. Zhen said he could not reveal much but that the woman's husband was a prisoner of the emperor and she was trying to rescue him. The party went out to the desert and had the musicians play Bliss in a Lonely Orchard. Soon a male figure appeared in the distance and began to dance. Bone Breaker mirrored the dancing and slowly closed the distance. When the two were close enough to see each other, the figure looked surprised and disappeared below the sands. Everyone fled back towards the inn. One musician was pulled beneath the sands but the rest of the group made it back. 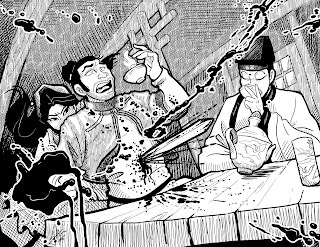 When they returned, Zhen was upset over the loss of his man and told Bone Breaker to arrange the meeting with Niang immediately. Bone Breaker sat down at Niang's table and talked to her for a while. He then said he had information that would be of interest to her, if she met him in an hour about two miles from the inn. She agreed to the meeting. As Bone Breaker spoke with Niang, San and Chen took the musicians to the roof and had them play Bliss in a Lonely Orchard. Again the figured appeared on a distant rock and instead of dancing it began to sing. Soon the roof was engulfed in flames. One of the musicians caught fire and fell off the building to his death. San and Chen ran down to the inn to inform Bone Breaker but when he stepped outside he saw no sign of fire. Convinced it was an illusion, he went to Stone Foot and asked him about the innkeeper's body. Eventually the bandit lead the party to where they'd buried Pei Hai and the inn staff. They recovered the body, they also found Pei Hai's flute. The whole group all went back up to the inn roof, this time they had Stone Foot bring one of his men who could sing the song. The musician played the melody on the flute and the figure appeared again. However this time it floated from the rock to the inn roof. Up close it looked like a normal man. When it reached them and saw the musician wasn't Pei Hai, it reached back to strike him in the chest. Bone Breaker asked him not to strike the man and said he had Pei Hai's body, which he pointed to. The demon took the body in its arms then asked where the killer was. Bone Breaker said if it could wait a moment he would find the murderer. Stone Foot inched back and tried to jump off the roof, but Jade Priestess caught him with her Arms of Silk technique. Bone Breaker spoke with him in private and asked if anyone else was involved in the murder directly. He said one of his men had helped deliver a fatal blow to Pei Hai. Bone Breaker handed that man over to the demon, which seemed to satisfy it as it promised to leave them alone. They then returned to the drill to resume their efforts to reach the Emerald Empire.